There was a quiet celebration last week among gold-stock traders. 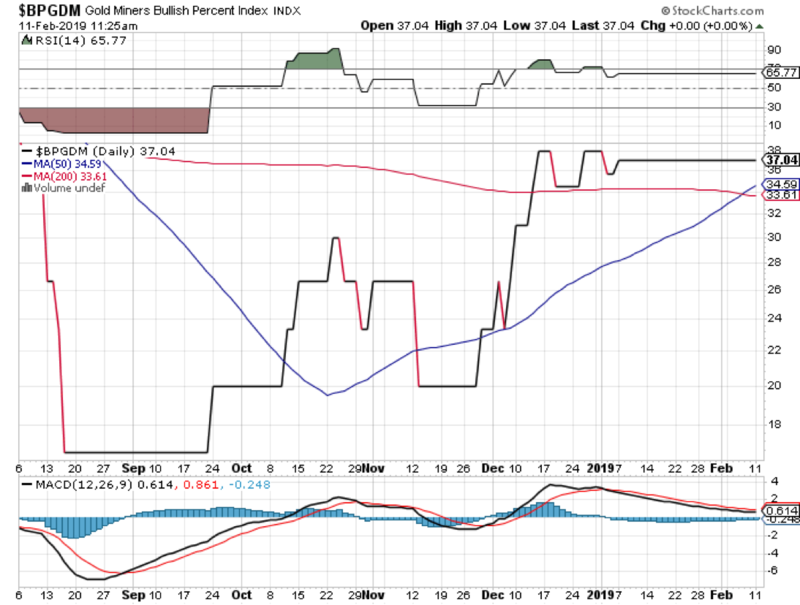 On Thursday, an aptly named “golden cross” appeared on the daily chart of the Gold Miners Bullish Percent Index. You’ll be forgiven if you didn’t hear the champagne corks popping. Not everybody follows this metric. The index tracks the proportion of gold stocks exhibiting bullish patterns in their point-and-figure charts. So, where does the cross come in? The index’s 50-day moving average (the blue line in the price chart above) crossed above its 200-day average (the red line). That’s a universally accepted sign of upside momentum. The quietude of last week’s festivities stems in part because the actual bullish percentage is still low: It’s only 37 percent. Yet, that’s nearly double the level seen in the autumn of 2018. If you’re a gold stock watcher, you might have already noticed the rebound in some of the miners’ prices. There have been other clues of bullish stirrings in the miners, to be sure. 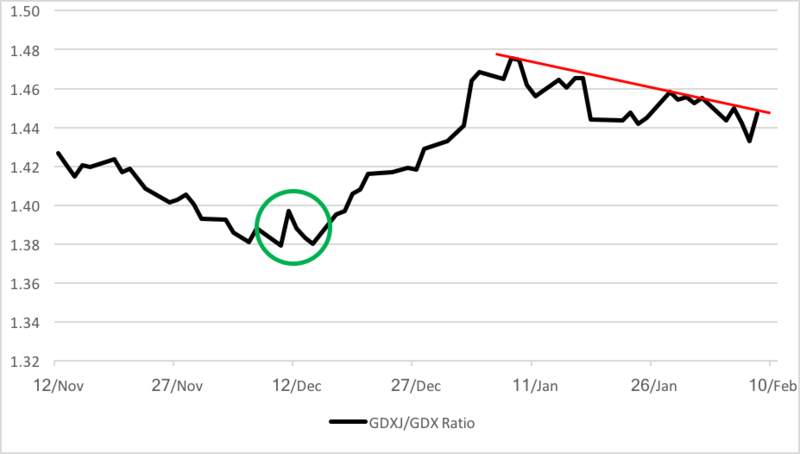 The Gold Miners Ratio, the quotient of the VanEck Vectors Junior Gold Miners ETF (NYSE Arca: GDXJ) price over that of the VanEck Gold Miners ETF (NYSE Arca: GDX), pulled up from its downtrend back in December. GDX is a portfolio of global precious metals producers with a decided U.S. tilt. More than 70 percent of GDX’s market capitalization arises from domestically domiciled companies. GDXJ is GDX’s younger sibling and is made up, in large part, of smaller companies still in their exploratory and development stages. Many of these companies have yet to generate revenue, let alone earnings. Obviously, an investment in GDXJ is more speculative compared to GDX, so variations in the level and direction of their price ratio indicates gold punters’ risk appetite. This winter, GDXJ’s price rose at a faster pace than GDX’s, as reflected in the chart above. Brad Zigler's stints as a contributing editor for the Corporate Communications Broadcast Network, the Journal of Indexes, and CRB Trader set the stage for his role as managing editor of Hard Assets Investor and later as alternative investments editor of Registered Rep. magazine, the most highly subscribed publication for financial advisors. Brad's feature articles have appeared in Registered Rep., Mutual Funds, Financial Planning, Financial Advisor, Futures and Ticker magazines, TheStreet.Com and MarketWatch Web sites, and in journals published by Institutional Investor. After heading up marketing, research and education at the Pacific Exchange's (now NYSE Arca's) option marketplace and Barclays Global Investors, Brad became a financial correspondent for the European Press Network, and a Public Broadcasting System/National Public Radio affiliate. He continues his work as a financial research and communications consultant for a number of private and public organizations.